Gov. Bill Walker plans to be in Sitka on Wednesday (8-19-15) to visit the site of the Kramer Avenue landslide. He is expected to arrive around 8 a.m.
Search and rescue and debris removal efforts at Kramer Avenue were slated to be suspended at 8 p.m. because of darkness. The work will resume at 8 a.m. Wednesday morning. Officials are now reporting at least six slides in Sitka on Tuesday (8-18-15): two at Kramer Avenue, including one on the north end, which has no houses; one on Sawmill Creek Road, damaging the administration building at the Gary Paxton Industrial Park; one on Harbor Mountain, closing Harbor Mountain Road; one along the Gavan Hill trail; and one at Green Lake. Officials now say only three people remain missing in today’s landslide: City building official William Stortz, 62, and construction workers Elmer Diaz,26, and Ulises Diaz, 25. The area remained unstable and officials suspended search and rescue efforts for several hours this afternoon, over fears of further landslides — though rescuers did manage to pull a dog alive from the debris. As of Tuesday evening, rescue and debris removal efforts had begun again, and were planned to continue until dark, and pick up again in the morning. Another slide has been reported in a more remote area, on Harbor Mountain. Harbor Mountain Road has been closed above the first gate at the bottom of the hill. Sawmill Creek Road has been closed beyond Silver Bay Seafoods, as crews work to remove the debris. Near the Kramer Avenue landslide, the city had closed Sand Dollar Drive, Whale Watch Drive and Kramer Avenue itself. 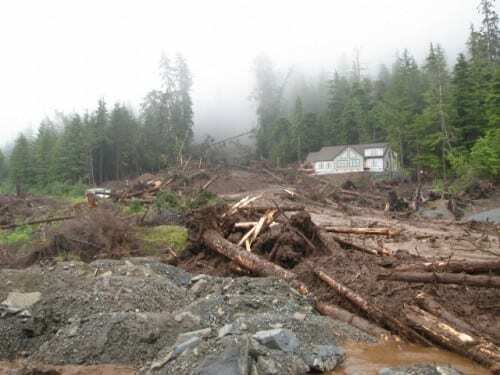 Recovery operations have been suspended at the site of a major landslide in Sitka, after officials became concerned over instability of the failed slope. Four people remain unaccounted for in the slide, which destroyed a new home under construction, and damaged another. Sawmill Creek Road has been reopened. A second slide this morning crossed the road and damaged the administration building of the Gary Paxton Industrial Park. A third slide, near Jacobs Circle, did no damage. Four people are believed missing in a landslide that occurred in Sitka early this morning (8-18-15). Those missing were all likely involved in the construction of several new homes on Kramer Avenue. The slide in that area destroyed one of the new homes entirely, and damaged another. Neighbors have reported a second slide on the northern end of Kramer Avenue, in an area that has not yet been developed. Heavy rains triggered what now appears to be three landslides in Sitka in the early hours of the day. A slide across Sawmill Creek Road heavily damaged the administration building at Gary Paxton Industrial Park, but no injuries were reported. The building was evacuated, along with the Silver Bay bunkhouses. Sawmill Creek Road remains closed beyond Whale Park. The National Weather Service recorded over 2-and-a-half inches of rainfall in the six-hour period between 4 and 10 AM. The flash-flooding prompted trail closures at Sitka National Historical Park. 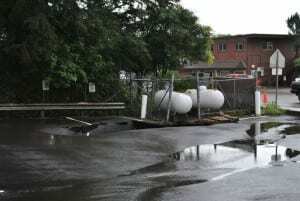 Flooding in the parking lot of the Sitka Laundry Center opened a sinkhole in the pavement. Two propane tanks on the edge of the sinkhole have since been removed. Sitka Police and Fire departments are asking residents to please refrain from calling, as phone lines are needed for emergency communication. Also, there is no need for additional volunteer help at this time. The City and Borough of Sitka has declared a state of emergency after heavy rain triggered at least three different landslides this morning. 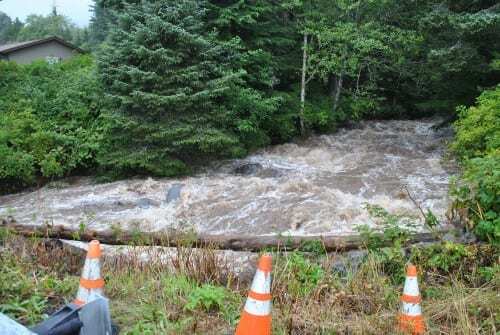 The Sitka Fire Department has reported one slide on Halibut Point Road, one on Kramer Avenue, and one on Sawmill Creek Road, near the Gary Paxton Industrial Park. The slide on Kramer Avenue has damaged at least one house. The extent of the damage is not yet clear. Anyone who was working on the construction on Kramer Avenue is asked to call the Sitka Police Department at 747-3245. Sitka Search and Rescue is trying to account for everyone who might have been in the homes affected by the slide. The Fire Department has closed Sawmill Creek Road at Whale Park. Kramer Avenue is also closed. Halibut Point Road remains open. KCAW has also received reports from residents in the 2200 Block of HPR below Kramer Avenue that homes have been evacuated. Raven News will have more updates as information becomes available. PreviousSitka ‘landslide cluster’: Too soon to blame on changing weather?